The story goes that Ralph Nader's unemployed, high school graduate brother was able to save enough pennys on his own in the early 1970's , that he could afford to buy a $100,000 home in an exclusive Washington neighborhood. Of course, Ralph was repeatedly seen sneaking into the house at night, but hay, he was only there to visit his brother, right? Later the deed to the house found its way into the hands of my former boss, Nader's sister Claire. Everyone knew that Ralph had rented a single room with a bathroom down the hall. Everyone knew that Ralph lives a lifestyle which made Mother Teresa's lifestyle look luxurious. The Nader family comes from a part of the world where Christians consider Simeon Stylites to have been a great saint. 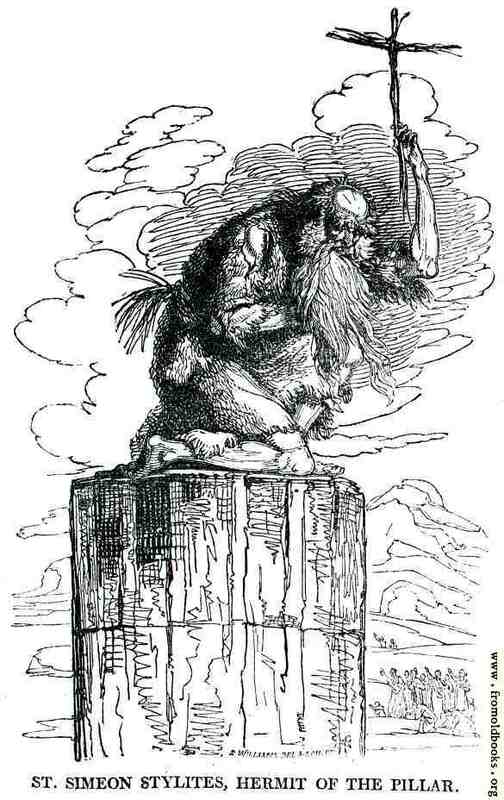 Stylites spent 37 years very publicly perched on top of a pillar, as a manifestation of his saintliness. Stylites lived at a time when the Manichaean word view was fashionable. Manichaeans divided the world into good and evil, and sought to avoid the latter. Although Stylites was not a Manichaean , perching on his pillar might have appeared a good way to avoid evil. Of course, if you spend 37 years on you of a pillar, you have to be crazy. It probably never occurred to Stylites that the truely horrible way he treated himself was evil and that drawing attention to what he was doing was a sin. Tempting others to follow his example was also a sin. Ralph Nader did not perch on a pillar, but he did claim residence in that single room for many years. Yet despite his public image Nader is no saint. He is a businessman who shrewdly uses his public image as part of his business plan, and Nader does have a very unusual and interesting business plan. It all started with Nader's expose of the American Motor Industy, "Unsafe at any Speed." Nader was a lawyer, and "Unsafe at any Speed" was a trial lawyers brief against the auto manufactures. There were serious flaws in Nader's case. Nader argued, in effect, that auto manufacturers were responsible for the safety defects of American cars, and this certainly seems plausible. There is a problem however, with Nader's arguments. First Ford Motors had during the 1950's attempted to sell cars on the basis of superior safety. They had offered optional safety features to the public. But Ford quickly discovered that the public was more interested in bigger engines and flashier tail finsb than in safety. The Ford effort to sell cars on the basis of safety fell flat. Thus the auto manufactures shared responsibility for poor auto safety with the American public which was not interested in safety features or a safer design. Secondly, Nader picked out the Chevrolet Corvair as his center peice of unsafe cars. In fact the Corvair was not conspicuously unsafe. Indeed Nader himself does not appear to have believed that the Corvair was so unsafe that he would not ride in one. Nader was once riding in a Corvair when the driver was tickets for speeding. Nader worried that the ticket along with Nader's presence in the car would become public knowledge. Chevrolet had introduced the Corvair as an economy car in 1960. It was powered by rear air cooled engine. There were many attractive features to the Corvair design but the choice of a rear swing axil was questionable. The swing axil had been used in popular and widely admired German cars like the VW Beetle, the sporty Porsche and the luxurious Marcedes. Marcedes had found problems with the swing axil, and had first modified it, and eventually scrapped it. In the hands of most drivers the swing axel posed little danger. But when driven hard, a rear tire on a swing axil car could suddenly loose its grips, with a sudden loss of control. During the early 1960's most American cars had handling problems. Motorest were more interested in highway acceleration than rapid maneuverability. In fact, sophisticated drivers actually liked the nimbleness of the Corvair, and were aware that it should not be pushed to hard. General Motors, already had modified the design of the Corvair rear suspension in 1965, giving the Corvair the safest and most sophisticated rear suspension built on any American car. Thus by the time "Unsafe at any Speed" Nader's argument was no longer on target. This did not matter to Nader, who basked in the glow of the resulting publicity. Although Nader's tactics were questionable, his results were unquestionable. In 1966 Congress past new auto safety legislation. Thus Nader had accomplished what neither auto manufactures nor consumers had not been able to accomplish, making cars safer. In the process he had become a recognized and admired public figure. Few of his admirers noted that Nader had simplifed complex issues, and had focused far to much blame on the auto companies for problems that were ingerant in the market. Nader supporters also failed to notice that the improvements in auto safety were incrimental, rather than revolutionary. It was part of Nader's genius, that he next moved to franchise reform. Past reformers had picked out one reform issue, and attacked it, working for change. Nader next picked out the meat packing industry for attack. Meet packing is an easy target. Consumers don't want to know what happened to their Sunday beer roast on its way from being in the body of a live cow to its arrival on the dinner table. But from time to time reformers such as Upton Sinclair pull back the curtain and everyone agrees that the picture is awful. Laws and ruls are past. Meet packers agree to do better, and then as soon as the reformers back is turned, the meet packing industry. Nader briefly targeted the meat packing industry, but to dwell to much on the problems of the meet packers would have inevitably invited comparison to the Still Living Upton Sinclair, the author of the famous 1907 reformist novel, "The Jungle." Sinclair had created so much horror and shock, that the prostrate meat packing industry begged Congress to be regulated as a means of getting America to stop eating vegetables. General Motors tried to smear Nader, and Nader responded by suing GM and winning. He used the money to start the first Public Interest Research Group in Washington. The now famous Nader received speaking invitations from all over the country, and he made guest appearance on numerous TV programs. At this point numerous people flocked to Washing to help Nader and his crusade. At this point Nader the reformer and Nader the business man began to diverge. Although Nader portaryed himself as an enemy of the excess of capitalism, as soon as Nader controlled organizations began to acquire employees, Nader began to exploit them. The pay was pitiful, the hours long. Nader's organizations were raking in money, but where was it going? Certainly not for wages. Nader reportedly only received a pittance, $5,000, then $10,000 and even later $15,000 a year was all that Nader received for his unrelenting toil for the American people. Why he only rented a single room and did not own a car. Nader appeared to have no life. He reportedly worked 20 hours a day, 7 days a weel. He did not go on dates or to parties. One has to wonder if he ever bothered to eat. In that regard Nader did Simeon Stylites one better, because Stylites' life was so public, he was was always observed eating. There was of course the matter of the house. Nader had speaking fees. Perhaps he had used some of his speaking fees to purchase a house for his poor, under achieving, and under educated brother. When asked to perform services for others, like public speaking engagements, Nader expects limousines, expense account tabs, and nothing but the best hotels. Now I am not saying that Nader is not entitled to this, but it flies in the face of his carefully cultivated public image. There was the matter of money and stocks. 99% of non profit organizations are strapped for cash. Most pay workers decent but not excessive wages. Nader had absolute and secret control of the finances of each of his growing organizations. What was he doing with the money? In 1970 some unusual financial transactions by one of Nader's organizations, the Public Safety Research Institute, got some equally unusual attention. Nader's Public Safety Research Institute was audited by the IRS and fined. The IRS discovered that the PSRI was wheeling and deeling on the stock market. With $150,000 in assets PSRI had engaged in 67 trades involving $750,000. Many of these traids were highly risky. Some lost money. The IRS determined that Nader had been churning PSRI money. That is making such frequent trades that brokerage fees were diminishing the organizations resources. Nader was playing the market with money donated for the improvement of consumer safety. Nader was not above using the influence of his consumer interest activities to influance the value of stocks he speculated on. There are a number of inconstancies between the business practices which Nader advocates for other businesses, and his own business practices. For example, Nader advocates transparency for other business and government agencies. But Nader operated his own NPO's without the slightest transparency. Nader advocates business accountability enforced by government regulations, but ignored his own accountability standards in the business practices of non-profit organizations he controled. Nader denounced the governance of numerous international trade organizations. "The fundamental issue we face is the autocratic systems of governance that undermine democracy," Nader stated. Yet the governance of Nader's organizations was completely autocratic, with absolutely no democratic mechanism of control. Nader advocates "the rights of people for decent standards of living," but pays his workers a pittance. Nader denounced "giant global corporations who dominate and seek to dominate everything in their path" including "the workplace." Yet Nader sought to dominate the workplace of his own organizations. There are what by now have become legendary of stories about Nader's autocratic relationships with his workers. For example in 1984 Nader fired Multinational Monitor editor Tim Shorrock claiming that Shorrock had run a story about an alleged Bechtel's bribery of South Korean officials. Shorrock's crime was a failure to seek a prior Nader approval for the story. Shorrock's firing participated a very ugly fight. Nader's aides filed a $1.2 million civil suit against Shorrock and a couple of his supporters. Nader's aides accused Shorrock of stealing files and filled charges with the Washington, D.C., police. John Maggs tried to organize a union of Nader workers. Maggs told the Left Business Observer, "Nader's campaign against me was incredibly vicious. His top aides spread all kinds of rumors about me in Washington and managed to get me pretty well blacklisted from the public interest crowd (which actually was a good thing). They even tried to convince people I was a communist (!!!) out to subvert Nader's organizations. " That is right, Nader was an underhanded, totally unethical union buster. John Cavanagh, director of the Institute for Policy Studies, attempted to mediate Nader's union problems and stated "He seemed unable to see how this conflicted with his ideals." Cavanagh described Nader's anti-union activities as shocking. Nader supported affirmative action, but Charles Pekow alleges that when he worked for Nader in the early 1980's the Nader staff was all white, predominately young, male and from affluant social backgrounds. During a prolonged pre-employment period, Pekow was asked illegal questions about his religion, his family background, and his medical history. Many employees describe Nader's vindictiveness. According to Pekow, "Once, after a magazine editor printed a few lines he did not like, Nader punished him by demanding he travel from Washington, D.C., to Baltimore to change the copy, knowing the editor had been up all night meeting his deadline." Nader's tyrannical ways, his miserly pay, and his demand that employees work unreasonable hours lead to rapid staff turnover. Nader raged against leaving staff. According to Pekow, when asked to provide recommendations for former employees, Nader would describe the former staffer in negative terms. Many of Nader's former employees, despite their mistreatment at Nader's hands are still full of admiration for his accomplishments. Ralph Nader isn't anti-business -- he is himself a businessman, a successful entrepreneur who over the decades built an empire of nonprofit corporations that sell things, earn money, pay their bills, and grow. Like many founders, Nader has a great talent for marketing, and he's helped create some well-regarded brands -- Public Citizen and Congress Watch, for example. Likewise, Nader isn't an enemy of capitalism, but of what he sees as one of capitalism's regrettable byproducts -- the mega-corporation. His campaign for president, like his 40-year career in public life, is based on a belief that big and ever-bigger corporations are destroying what should be a natural balance in our capitalistic society -- the balance between consumer and producer, between citizen and government, and between labor and management. "Ralph Nader may look like a democrat, smell like a populist, and sound like a socialist - but deep down he's a frightened, petit bourgeois moralizer without a political compass, more concerned with his image than the movement he claims to lead: in short, an opportunist, a liberal hack. And a scab." Nader is something else. Let's pretend we have Nader on the couch and are trying to make a psychiatric diagnosis. We observe that Nader has a very grand sense of his own importance, a sense which he has very successfully transmitted to his society. Nader believes in his own infalability, and the unquestionable justice of his causes. Nader very often places himself in the possition of being the little guy taking on much bigger opponents. He views himself on the side of good against evil. He has this Manichean consciousness. This strict division of the world, into good and evil;, right and wrong. Nader believes that he is special and that he does not have to follow the rules he expects others to follow. Nader actively and constantly courts admiration from others. He manipulates his own public image in order to gain greater admiration. He denied his own ordinariness, by pretending to live in a single room, and denied that he owned a home. Nader demonstrated a strong sense of entitlement by exercising total control over what were claimed to be public service organizations. He also exhibited a sense of entitlement by engaging in speculative investments of the finds of none profit organizations. Nader has a long standing pattern of taking advantage of his employees. The exploits them financially, and violates their bondry between work time and personal time. Nader demonstrates a lack of empathy for his employees. And in the face of criticism, Nader is inevitably arrogant. In short, Nader exhibits almost all of the classic symptoms of Narcissistic Personality Disorder. I have noted that Ralph Nader launched his career by an attack on the safety of the Corvair. In his discussion Nader failed to note that highly prestigious autos like the Marcedes and Porsche used the same suspention design found in the Corvair. He failed to note that there was no empirical evidence that there was a greater accident risk with Corvairs than with other American cars. Finally Nader failed to note that General Motors had already altered the Corvair suspension design. Thus Nader cherry picked facts, to build his case. Nader functioned as an an advocate, rather than an objective reporter of facts. Thus Nader's use of facts, was not fair, balanced, and unbiassed. Nader's manipulation of facts was also a manipulation of his own public image, since the subtext was that he, Ralph Nader was a little David, fighting an evil Goliath. This is totally consistent with Nader's Narcissism. Nader's ultimate goal is public adulation. In seeking that goal, he engages in no small anount of deception. Nader frequently employes dishonest means and outright dishonesty as part of his strategy. Thus Nader ignores the distinction between advocacy and objectivity, and further is Nader is ready to violate the truth is the interest of a Nader cause. Even worse, critics charge that Nader has been willing to sell his voice in legal issues and for political causes. David Sanford. who worked during the early 70's as Nader's personal editor, reports in his expose, Me & Ralph. that Nader had assigned Lowell Dodge to a study of Volkswagen safety, "Small on Safety: The Designed-in Dangers of the Volkswagen." Nader was dissatisfied with Dodge's conclusion, and demanded that Dodge begin his conclusion with the words, "The Volkswagen is the most hazardous car in use in significant numbers in the U.S. today." Dodge responded, "the conclusion is not reflected in the data," and detatched himself from further work on the project, which was completed as Nader directed. Later dodge was to say, . "I have always carried around considerable guilt about what I regard as the extreme intellectual dishonesty of that conclusion." Most of Nader's former associates who criticize him, also express great admiration for him. They are wiling to see Nader in gray, not just black and white. We should balance the many good causes he has espoused, and the many victories he has won, with the evil he has contributed too. Nader does, after all, have some responsibility for bringing George W. Bush to the White House. Nader should not be lauded for his attacks on nuclear power. My interest here is to raise questions about Nader's credibility as a critic of nuclear power. My contention is that Nader's standard for personal integrity would have been far lower than that which people like my father and Alvin Weinberg sat for themselves. It is the advocates of nuclear power, and not its critics, who should be lauded for their honesty, integrity and devotion to human well being. I will next examine Nader's assertions about nuclear power, and the numerous errors and coginitive flaws which Nader exhibited in his anti-nuclear attacks. I saw Nader speak once when I was an undergrad, and I have to say I wasn't impressed. That said, I had never imagined that he was this personally unpleasant (not to mention hypocritical). I do find it ironic that he critiques "corporate power" as he does, as Nader's most important legacy, OSHA, has actually increased the power and influence of large corporations at the expense of small businesses. The particular kind of government oversight Nader loves is the worst of both worlds- small businesses have difficulty complying with byzantine, often arbitrary regulations, while the megacorporations Nader hates can use their financial and legal resources to game the system and get away with whatever they want. I am curious, however, to know what part of Nader's legacy you believe was positive. I personally believe that consumer protection should always have been based on a liability model that would still hold corporations responsible for selling unsafe products, but avoiding the corruptibility and inefficiencies of regulatory bureaucracies. As such, I have great reservations even about the things that Nader did "right." Here is a list of claimed Nader accomplishments from a pro-Nader Web page. Many of those accomplishments would have happened without Nader, because Nader had the ability to tell which way the bandwagon was headed, and to jump on at the right moment, thus garnering credit for what would have happened anyway. It should be observed that some Nader "accomplishments" like "The Whistleblower Protection Act" are of doubtful value in accomplishing Nader goals, while others, for example Nader's alleged contribution to Nuclear Power Safety, may well have caused far more harm than benefit to the public.